South Brunswick, N.J. (May 23, 2018) – New Jersey and national conservation groups praised Gov. Phil Murphy and state legislative leaders for the sweeping clean energy legislation that was signed into law today. The measure will create good, local jobs, reduce toxic pollution and make the state a national leader once again in the development of clean energy technologies. The groups also applauded the governor’s announcement of an executive order that directs the New Jersey Board of Public Utilities to develop a plan to achieve 100 percent clean energy by 2050. 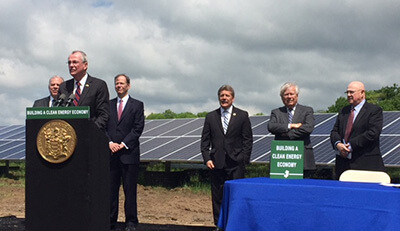 “This landmark legislation and executive order show that New Jersey is serious about rapidly adopting clean, renewable energy. From far-reaching environmental benefits, to tens of thousands of jobs that strengthen our economy, to lower emissions that fend off climate change and improve our health, the advantages of clean energy are undeniable. With these actions, Gov. 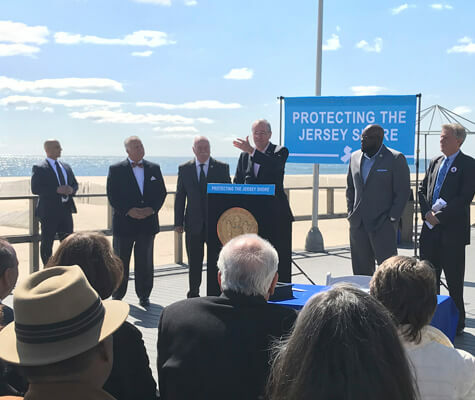 Murphy is making New Jersey a national leader in the transition away from fossil fuels toward a healthier and more prosperous clean energy future,” said Tom Gilbert, campaign director, ReThink Energy NJ and New Jersey Conservation Foundation. “The clean energy bill is a great down payment on Gov. Murphy’s commitment to 100 percent clean energy by 2050. I couldn’t be more thrilled the governor took this initiative one step further today by signing an executive order to update the energy master plan toward the 100 percent clean energy goal,” said Ed Potosnak, executive director, New Jersey League of Conservation Voters. The energy efficiency provisions in the bill could save up to $200 million per year for the state’s residents, and could triple the number of residents working in energy efficiency to more than 100,000. Continued growth of solar energy and development of offshore wind would create additional jobs and spur new industries in New Jersey.